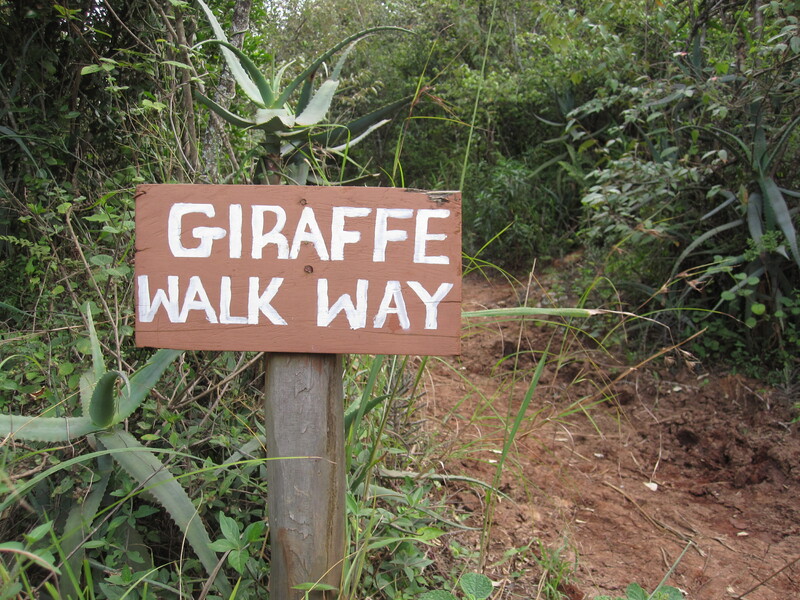 The African Fund for Endangered Wildlife (AFEW) Giraffe Center was founded in 1979 as a conservation effort in Nairobi. 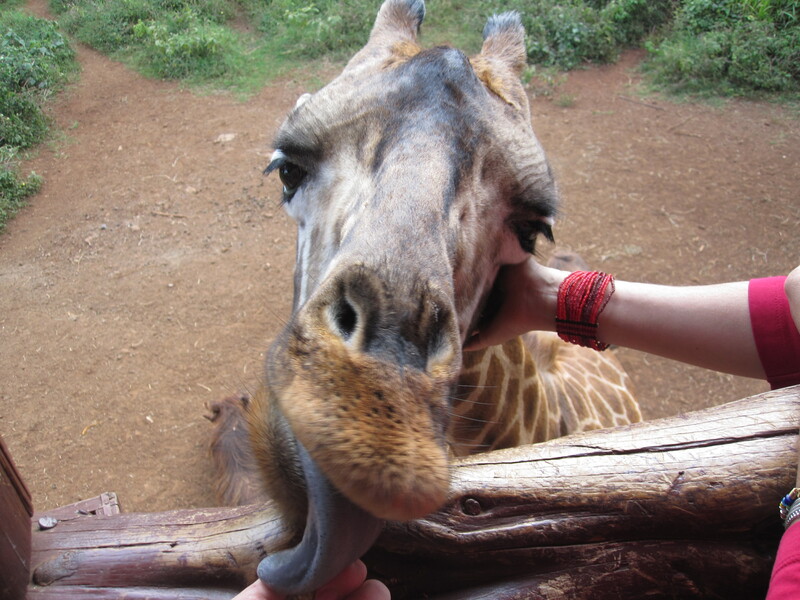 Now you can go to the Giraffe Center and pay to let giraffes slobber all over your hand. Apparently their saliva is antiseptic, though I am skeptical given that I fell deathly ill the day after my visit to the giraffe center. The way it works is you climb up onto this high-rise wooden veranda structure, and hold out your hand full of pellets until Eileen or Harry or one of the other spotted giants comes over and slurps up the pellets with its sand-papery grayish-purple tongue (that is close to a foot long). I LOVE giraffes. I think it’s because I related to them as a gangly, long-legged and slightly awkward child and adolescent. To this day I am intrigued by these gentle giants. They’re very unassuming creatures, happy to munch on leaves and saunter around totally unaware of how improbable of an animal they are. Their eyes are calm, almost glass-like. Overall the giraffe appears to be a very content creature. 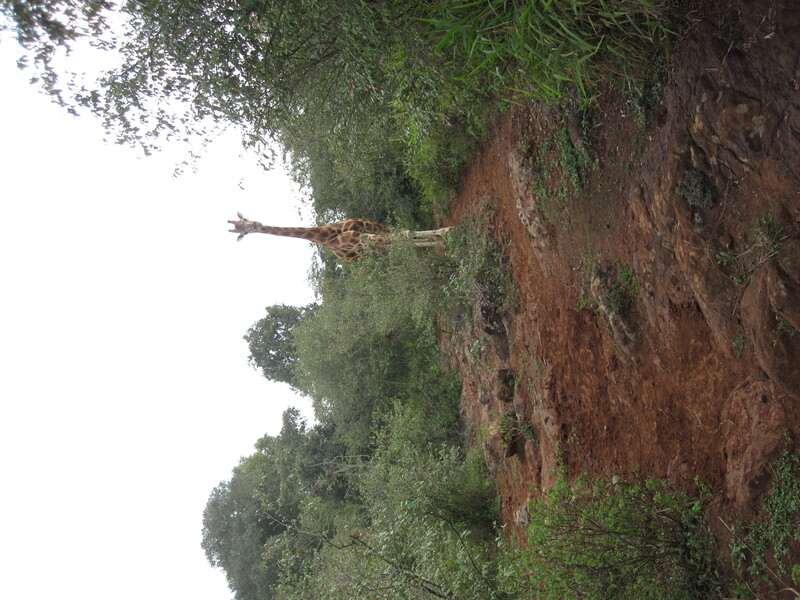 So when a soft rustling of leaves became louder and louder, until it could only mean one thing – that either a thug or a giraffe was about to emerge from the bushes just up ahead – I stood quite still in the middle of the trail, prepared to run as fast as I could if whatever came out of the bushes was not a welcome sight. That’s when the speckled, knobby head appeared. At least 6 feet above the top of the bushes. 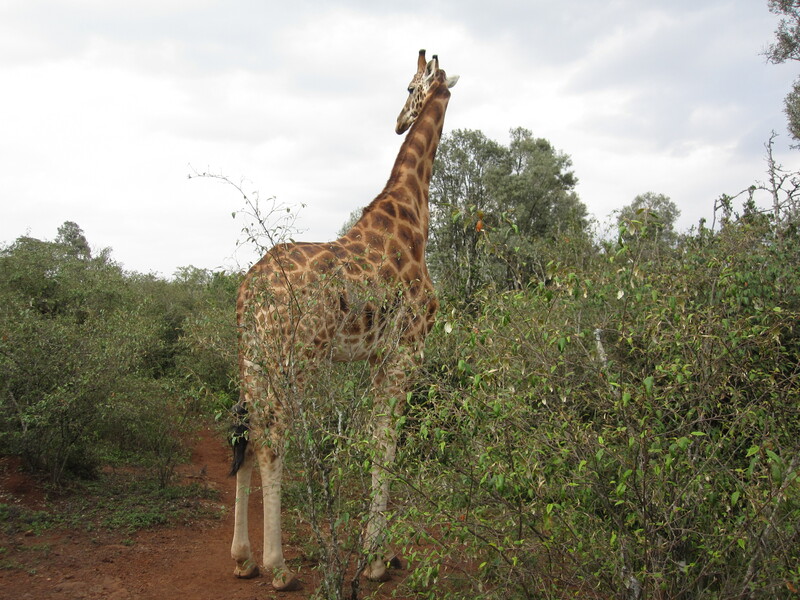 All of the sudden, this immensely long neck and head were coming towards me. Wha. This does not happen in real life. I figured I was hallucinating. But then I remembered – I’m in Kenya. This happens in real life in Kenya. Doh. I suddenly felt very, very, very small. 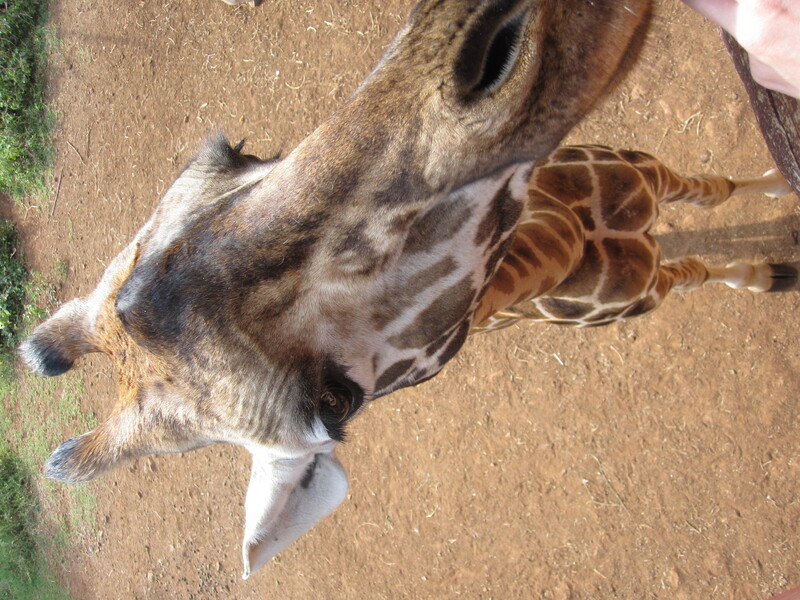 And the giraffe was coming closer. I didn’t know how friendly this thing would be. Especially when it found out I didn’t have food. So I tried to sidestep it a bit, let it take the whole path and be on its merry way. But it came closer. So I walked clear to the other end of the trail, trying to give it space. It followed me. Seeing as I didn’t particularly feel like being a) stepped on b) bitten or c) pooped on, I decided my best course of action was to get the hell out of this giraffe’s way. The trail was small and there was no way this was going to end well if I did what I really wanted to do (walk up to it and pet it). So I hightailed it the way I had come. I didn’t go 10 feet before I turned to see if it was following me. It had vanished. Not an easy thing for a 20 foot tall giraffe to do. So that was that. When the tallest creature you’ve ever seen comes towards you, take a moment to soak in the utter unlikelihood of your current situation, and then quickly walk away, remembering just how relatively small and unimpressive a creature you are. This entry was posted in Not pie and tagged africa, giraffe, kenya. Bookmark the permalink.